Author Susan Sontag, widely regarded as one of America's leading intellectuals, has died aged 71. The writer, who had suffered from leukaemia, died at the Memorial Sloan-Kettering Cancer Center in New York. Calling herself an "obsessed moralist", Sontag was the author of 17 books and a lifelong human rights activist. She wrote best-selling historical novel The Volcano Lover and in 2000 won the National Book Award for another historical novel, In America. Her greatest literary impact was as an essayist, however, with her 1964 study of homosexual aesthetics Notes on Camp establishing her as a major new writer. The essay introduced the "so bad it's good" attitude toward popular culture, applying it to everything from Swan Lake to feather boas. In Against Interpretation, Sontag worried that critical analysis interfered with the "incantatory, magical" power of art. "I know of no other intellectual who is so clear-minded with a capacity to link, to connect, to relate," Mexican novelist Carlos Fuentes once said. 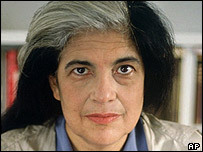 Sontag, who described herself as a "zealot of seriousness", was also a human rights activist and an outspoken opponent of US foreign policy. She prompted controversy when she wrote that the September 2001 attacks on the US were not a "cowardly attack" on civilisation, but "an act undertaken as a consequence of specific American alliances and actions". She also criticised US President George W Bush over the US-led war in Iraq. In the 1990s Sontag travelled to the then Yugoslavia, calling for international action against the growing civil war. She visited the besieged Bosnian capital Sarajevo in 1993, where she staged a production of the play Waiting for Godot. Sontag had been treated for breast cancer in the 1970s.